After a brief absence fighting off the flu--which is apparently traveling through France (and New York and Pittsburgh based on the comments of my friends back in the US!) .....I was knockin' on death's door--okay, a bit too dramatic.... but wow--it was horrible. You know when you feel so bad that you beg every person that passes your bedroom to please, please, please just put you out of your misery? That bad. But I am over it... finally. And back to loving food and wanting to cook and wanting to share food! So if that hasn't entirely put-you-off.....still with me? On one of my last visits to our local 'bio' farm, Le Chateau, I filled my basket with leeks, cabbage, beets, onions and about a dozen very 'petite' pommes. It might be hard to scale from the pictures, but these little apples are only just slightly larger than a golf-ball and I thought they were not only cute, but also perfectly snack-size or 'Petite Fille' size. 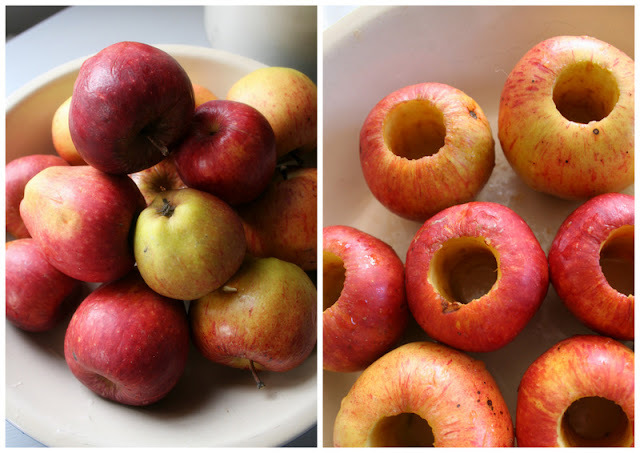 This week as I was coring one to fill with peanut-butter for my eight year old, I thought how fun it would be to make mini-stuffed baked apples with them...a bite-size desert. 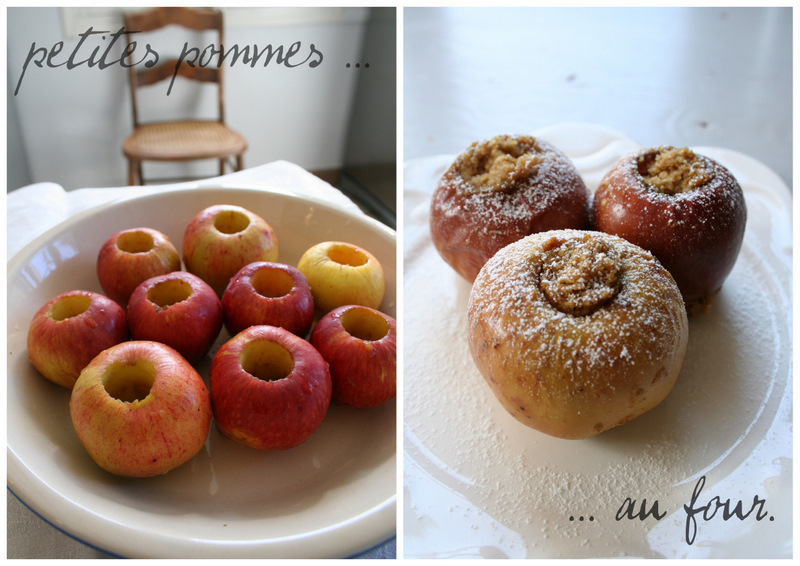 Although perfectly cute, and perfectly sized, these little pommes are not at all perfect. They are grown organically and their nibble marks and less than perfect skin attests to this....but this point also makes me most happy about buying and eating them.....imperfection is perfection! When I was taking the images for this post I was really noticing that although they may not win any beauty contests, their flavor and 'purity' easily made up for it. For my recipe I used the tiny apples and filled nine of various sizes, but normally I think this batter will fill 4 regular apples--as you are only filling the cored recess. Combine dry ingredients, then wet, then mix all. The texture is similar to cornbread which is lovely with the softness of the baked apple, so now worries to beat or use an electric mixer, just blend by hand and fill apples. Fill them only 3/4 up because the cake will rise out the top and spill over, but then some will also leak out the bottom a bit too. Bake filled apples at 350F for about 25 minutes or until apples are soft when poked. Happy Monday mes amis! It's great to be back in the kitchen! Ah You are so clever. Love your culinary creativity.